This specialized table is used to treat bulging or herniated discs, degenerated discs, failed low back surgical syndrome, chronic facet syndrome, spinal stenosis and chronic neck and back pain. It is also effective for acute conditions like a pinched nerve in your neck or sciatica. Since 2014, 90% of our patients have shown (through objective scoring) good to excellent results in pain relief and improved daily activities function. 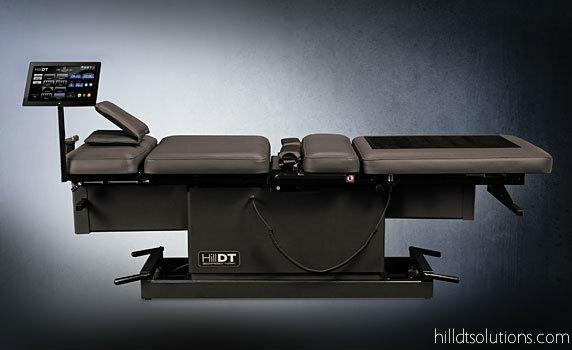 Decompression therapy slowly and gently lengthens or releases pressure in the spine through repetitive movements by a customized treatment table. The table pulls and releases, creating a pressure change within the intervertebral disc, surrounding soft tissues and joints. This pressure change allows the disc bulges or herniations and nutrients to be pulled back into the disc. Rehydration of the disc and surrounding structures creates a physiological change which assists the body’s natural healing process. Click here to watch patient testimonial videos, and here for a list of FAQs.